“Zeta coward.” Stealth hissed, already at the base of the outcropping and pulling her soaking wet self up onto it. 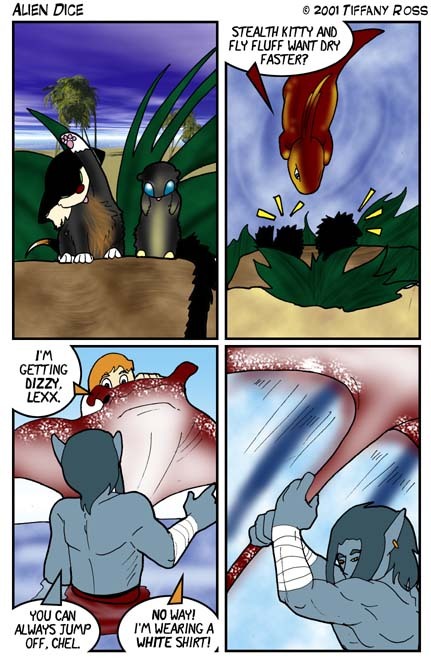 “Zeta big dum-dum, wet head!” Fly mocked Zeta, clinging onto the end of Stealth’s tail. He was in even worse shape as his thick tail had soaked up the water like a sponge. Stealth strained to get a hold of the top of the rock, but the added weight was too much. “Fly, let go!” Stealth hissed, her small claws scraping over the wet rock repeatedly. Zeta hopped forward with a splash, swung around and smacked his tail into the water, sending an arc of water on top of the two. It was more than Stealth could handle and she lost her grip completely. Both she and Fly fell back with earsplitting shrieks, as though they were plummeting to their deaths. “Zeta think little fuzz balls talk less bad about Zeta, watch where climbing!” Zeta turned the other way, splashing them again. Stealth hissed and managed to make it to the top of the rock without Fly dragging her down. The squirrel splashed about futilely a moment before Zeta flipped him onto the outcropping with his head. “Yuck.. yuck.. yuck.” Stealth began drying her fur the old fashioned way,.. with her tongue as Fly got situated next to her and started grooming as well. The salt water from the ocean didn’t quite agree with either of them and for the first time in her life, Stealth wished for a bath with warm soapy water. Out further into the bay, Skate was hovering in circles around Lexx and doing so in an up and down manner, much like a roller coaster. Chel was beginning to feel sick from all the circling and ups and downs, as well as the heavy smell of the ocean. “I’m… getting dizzy, Lexx.” She called out as Skate came closer to him. “You can always jump off, Chel.” Lexx smiled again. He’d been doing that a lot lately and the smiles were getting more and more dark in intent. “No way! 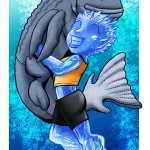 I’m wearing a white shirt!” Chel yelped, tightening her hold onto Skate’s top fins. Why had she brought the white shirt? Probably because it was the last clean shirt she had and it’d be cooler than a dark one, but there was the aspect of water she should have taken into account. As well as the aspect of ending up in it. 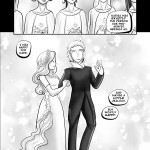 As skate passed over Lexx, he reached up and grabbed her by the tail, jerking her backwards. “Oro!” Skate tilted to the left and Chel went flying off with a screech and a loud splash.